Benheck.com will be undergoing a Server Migration over the next few days. Please excuse our mess! The forums have been “snapshotted” as of 2-15-18 and their database already transferred to the new site. I want to keep them up as a lot of things still link there but I am going to consider them “classic” from this point forward, a new solution will be incoming. I have just finished work on our custom pinball machine “America’s Most Haunted” which has entered production and started shipping. You can read more about it here. I’ll also make a large, in-depth article about it on this site once I get a chance. I’ve been working non-stop on this game, The Ben Heck Show, and other commissioned work since mid 2012. It’s time for a break. I’m going to be limiting my non-show commission work to 8 billable hours per week for the foreseeable future. This includes single-handed controllers, prototype work for companies and individuals, basically anything outside of our show. If you’d like to contact me about a project you may do so at benjamin.heckendorn@gmail.com. Keep in mind that this time allotment will be on a first-come, first-served basis. The automatic Paypal links for the single handed controllers will be coming down during this time as well. If you’re still in need of a controller, please contact me via email. I will probably spin the production of those back up in time for the holidays. I know there’s a great need for them, but there is also a great need, personally, for my sanity. I had the wrong file linked to Episode 80 of the podcast – sorry about that! You can find the corrected version here. We are still doing our best to release a podcast once a month, time permitting. You can of course keep really up to date with what we’re up to on The Ben Heck Show, follow me on Twitter, or visit my YouTube channel using the links on the right side of this page. We’ll be at Maker Faire San Mateo next weekend filming an episode of our show – stop and say hi and we might give you a t-shirt! I will be attending the Northwest Pinball Show in Tacoma this June. Ask me anything you’d like about our new pinball machine! Good chance I’ll also attend California Extreme and there might be an America’s Most Haunted machine there as well. More info as it becomes available. It’s a free ride when you’ve already paid – Ironic! A no-smoking sign on your cigarette break -Unfortunate, not ironic. Would be ironic if you worked at Phillip Morris. It’s like ten thousand spoons when all you need is a knife -Ironic! The goal here was to create an interesting, functional, sturdy design and then have it be available pre-built or as a kit. 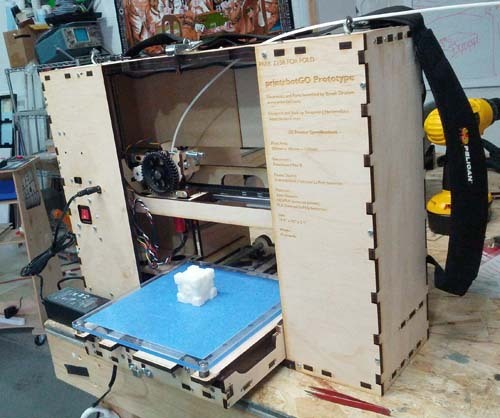 This is the first prototype and will be demonstrated at World Maker Faire New York weekend of September 28th – 30th. Print size 200mm x 185mm x 150mm. Not sure why I lost that 15mm on the Y axis, will probably have that at 200 as well in the future. Runs off a wall wart power brick or internal Li-Polymer batteries. We estimate 2 hours print time in PLA. Folds up to a size of 19″ x 14.5″ x 5.5″ – can fit in a plane’s overhead bin. Much smaller “deployed” footprint than my previous models. For lots of build photos and more details, click below! 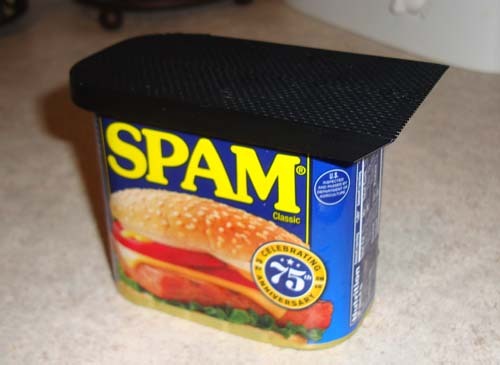 I love coming up with solutions for not-terribly-obvious problems, such as how it’s really difficult to put Saran wrap around a half-eaten can of Spam. So after several attempts to get the fit “just right” I have created the Spam-Saver Lid, which you can download and 3D print from Thingiverse! Happy printing and good eats!